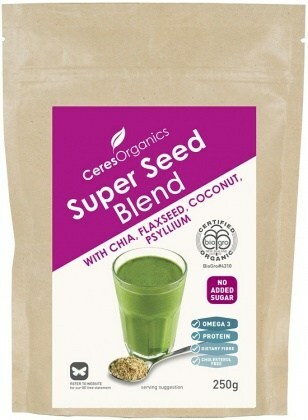 Ceres Organics Super Seed Blend is made with a remarkable combination of chia, flaxseeds, coconut, and psyllium. It tastes naturally sweet and is power-packed with omega 3ï¿½s, protein and dietary fibre. Simply add it to your cereal, cup of yogurt and smoothies to reap the health benefits. Ingredients: Linseed (Flaxseeds) ï¿½ 34.8%, coconut ï¿½ 22.5%, sunflower seeds, chia ï¿½ 11.3%, sesame seeds, psyllium husks ï¿½ 3.2%. * All ingredients are certified organic.